Don’t just invest on the child, also invest in the child. ‘Investment on’ gives outer prosperity. 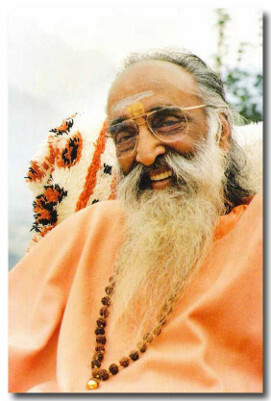 ‘Investment in’ ensures inner unfoldment and lasting prosperity. True education is ‘investment on’ the child complemented with ‘investment in’ the child. YEP is a one-year, work-study residential programme of All-India CHYK (Chinmaya Mission’s Youth Wing) for young adults (18-28 years) and aims at creating nation-builders of tomorrow. YEP provides insights to the problems faced by youngsters today and practical solutions to overcome them, empowering the young ones to Learn, Serve and Grow. ‘Yuva-veers’, as participants are called, are sent out to serve in different parts of India and the world, to apply and test what they have learned. Across the world today, youth impact the society and have power to bring change with the right vision, life skills and sense of compassion. Especially in a nation like India where the youth are about 35% of the population, they form the country’s greatest source of ‘renewable energy’ being the youngest and largest working force. The first seven batches of YEP have seen over 330 inspired youngsters who have not only served Chinmaya Mission in various locations and projects during the prescribed tenure of service but quite a few have even joined the Chinmaya Mission full-time, bringing with them dynamism and energy. The success of the YEP programme thus far, has led to the initiation of the same in the US with 31 youngsters having participated in the first batch of YEP West. The vision of YEP is to nurture the untapped potential of youth and inspire them to bring about a positive transformation in them and the nation as a whole. To achieve this goal, it empowers participants through its formula of Learn, Serve and Grow! 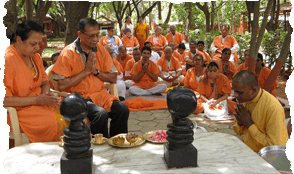 The first part of the training programme takes place in Chinmaya Vibhooti, in Kolwan, India. The facility covers 70 acres of serene, pictorial landscape surrounded by the Sahyadri Mountains. It is situated in India’s Kolwan Village, housed between Mumbai and Pune. The initial two and a half months of YEP is the period for learning and the course is conducted at Chinmaya Mission’s Vision Centre, Chinmaya Vibhooti, in Kolwan near Pune. Participants are exposed to Vedantic studies, group discussions, adventure activities, cultural performances, movie-based workshops, games, creative teaching methodologies and so forth to realise their potential. The diverse teaching faculty consists of spiritual gurus, management and industry experts and professionals from different fields. Yuva Veers from past batches enrich the programme by sharing their experiences on how to manage life, grow and evolve. 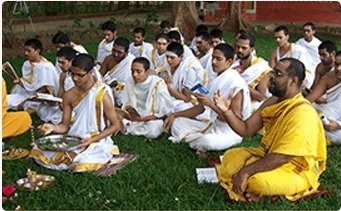 Subsequent to the theoretical learning in the training period, the students are placed at various Chinmaya Mission centres across the globe and responsibilities are allocated to them based on their aptitude. The service period plays a significant role in providing practical implementation of the knowledge received during the earlier part of the course. Participants gain concrete experience in various pursuits such as organising camps, conducting youth classes, creative writing, scripting and enacting theatre plays and serving in rural parts of the country. Yuva Veer reaches out to all age groups of citizens – from children (Bala Vihar), to youth (CHYK) and elders (through serving during Jnana Yajnas). 1) More than 3 lakh youth through college talks, national camps, theatre and youth classes. 2) More than 2 lakh children through Bala Vihars and school camps. Moreover, Yuva Veers have conducted over 200 competitions and Seva projects in villages through CORD, helping lakhs of underprivileged people to improve the quality of their lives. Upon the completion of YEP’s 12 months of training and internship programme, a Yuva Veer graduates with a clearer vision for life and a wealth of unseen assets including communication skills, self-confidence, ability to organize workshops and training programmes. Also, based on their aptitude and qualifications, participants find employment in their chosen fields. Most importantly, their one year with YEP grants Yuva Veers the fulfilment of their main purpose: the joy and sense of satisfaction in serving their motherland.